How can you store heavy, hand-loaded items, bins, tools, or components? When it comes to the storage of industrial equipment, products, and parts, you need a reliable heavy-duty solution. Whether you work in a warehouse, shop, office, or manufacturing facility, a proper system of organization is essential to the way that you keep records, manage inventory, solve problems, and care for your tools. Industrial rivet shelving is one of the most economical, versatile storage solutions available. Why? Not only does it assemble quickly and easily (and nearly tool-free), but it also comes with 1-1/2″ adjustable shelf levels, making it applicable for many different shelving applications. 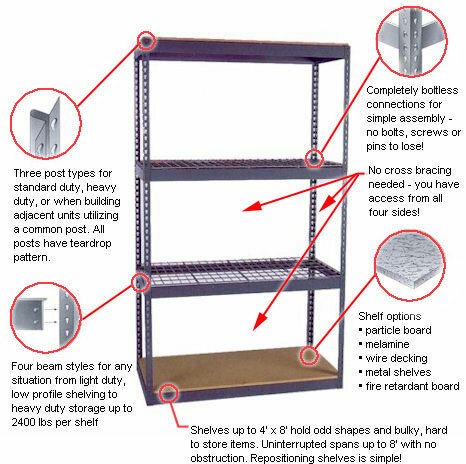 Rivet shelving comes with stable, accessible shelving units with up to 1,850 lbs. per shelf level. For additional information on rivet shelving, including how to design the exact rivet racking to suit your individual needs, refer to our rivet shelving specification guide. Rivet shelving offers the heaviest capacities you can get on hand-loaded shelving units, and it’s also the least expensive option. Its heavy steel components, long-lasting decks, and ability to work with anything from shelf bins to heavy components makes it ideal for bulk storage applications. The decision over open vs. closed metal shelving will depend on the needs of your particular application. Do you need to protect items and keep them secure, or do you need easier access to parts? Are you looking for a cleaner, more finished look or is more economical shelving a priority? Metal shelving, which includes everything from welded open steel shelving to shelving with modular drawers, serves a wide variety of material handling functions in warehouse and industrial applications. It’s strong, versatile, and easy to install/adjust, making it the most flexible shelving storage solution for the workplace. There are many types of steel shelving, which make it a versatile storage solution. The standard type is a simple post and shelf combination, which can often provide more shelf levels than rivet shelving. It can also be more heavily accessorized, with dividers, integrated bins, lockable doors, the ability to tilt your shelves for order picking, and other functionality that rivet shelving can’t provide. It’s more expensive than rivet shelving, but the versatility of steel shelving is unmatched. Rivet shelving records storage systems provide an organized, efficient solution to high-density archive storage. 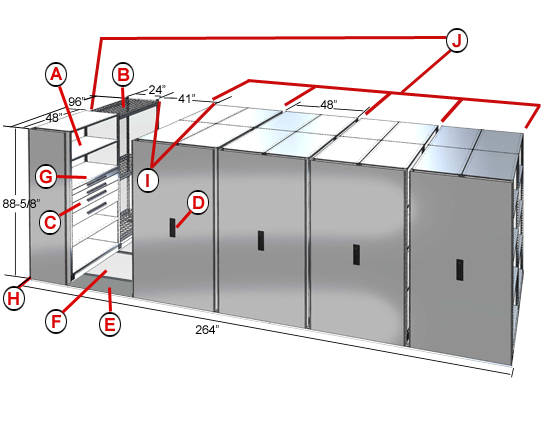 Multiple decking options are available for either racks or shelves; all unit box capacities are based on standard file box sizes. One distinct advantage to rivet shelving records storage is that it allows shelving access to stored file boxes from both the front and back. Other types of shelving (e.g., bulk racks, mobile aisle, and steel shelves) can also be used in archival applications, so it’s important to determine the correct storage media based on the needs of your particular application. By concentrating small parts, hardware, and components into a concentrated area, Rotabins eliminate wasted space found on the ends of shelving and increase the amount of usable space per square foot. Rotabins also take advantage of previously unused space, including corners, aisle ends, and undercounters.Because it utilizes the “Lazy Susan” rotary principle, rotabin shelving is unbeatable for storage density for its intended uses—small parts, components, and bulk hardware storage. Available in 17”, 28”, 34”, 44”, and 58” diameters, as well as multi-sized shelving, rotabins can help increase organization and storage density. Since each shelf rotates independently, more parts can be picked while an employee is standing in place than can be picked while the worker walks along rectangular shelving. Mobile aisle shelving systems, which eliminate walkway and aisle space, essentially create a mobile aisle by moving entire rows of shelving. Available in two drive systems, a crank-handle mechanical assist system and a handhold manual drive system (in addition to other configurations not listed on our site), mobile aisle shelving both increases organization and doubles storage space. Ideal for archival storage, manufacturing parts and supplies, maintenance, pharmacy, weapons racks, R&D, medical records storage, and tool rooms, mobile aisles offer versatile solutions that can be fitted with shelving, racks, modular drawers, and cabinets. Many configurations are available that are not listed. In any organization, the key to reducing downtime, ensuring a productive workforce, and improving both customer and employee satisfaction is to remain organized. The above industrial shelving solutions can help your organization increase efficiency and maximize all available space in your facility. Automated options like carousels are in play for heavy duty, high volume storage, but for many operations, shelving is economical, highly reliable storage. 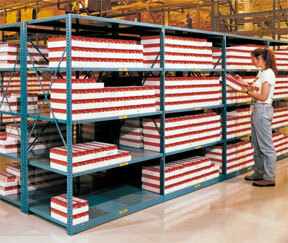 What industrial shelving solutions have you used to maximize storage capacity in your workplace?